If I had a Delorean, I'd go back in time to the early 90s and invest in bottled water - I'd be a millionaire by now. It's safe to say that bottled water is big, but it does get expensive when water from the faucet is considerably cheaper. That and the amount of plastic used in bottled water quickly adds up (yes I try to be green and leave less of a carbon footprint). I went from bottled water to using a Brita pitcher with tap water, but found that the Brita didn't remove all the bad stuff that you'd find in tap water. That's when I found the Aquasana Powered Water Filtration System which is super fast and, more importantly, more effective in filtering unwanted minerals from your tap water. 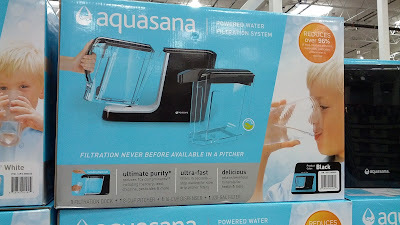 Unlike the Brita, the Aquasana uses pressure to filter water which makes filtering faster and in seconds. This is important when on a hot day and you're just dying of thirst. 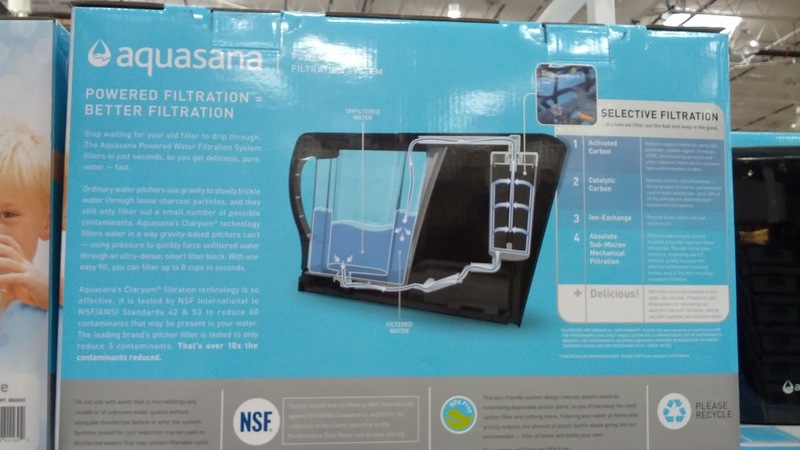 The true value of the Aquasana Powered Water Filtration System comes in the form of removing the unwanted bad stuff that you (and your family) are not putting into your bodies. The Aquasana removes this from your water making drinking from the tap safe and your water pure. 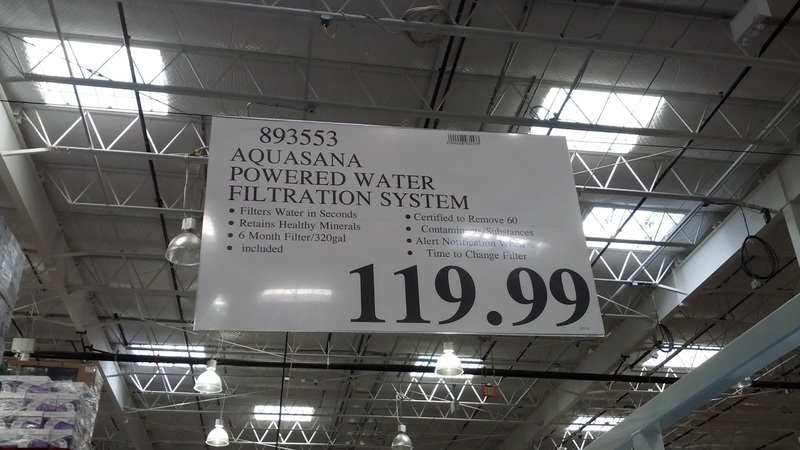 It goes to show that you don't need to buy bottles of Crystal Geyser, Dasani, Arrowhead, and Aquafina when you can just get the Aquasana. It'll be like drinking water from a glacier! Aquasana Powered Water Filtration System offers clean, fresh water for you and your family. 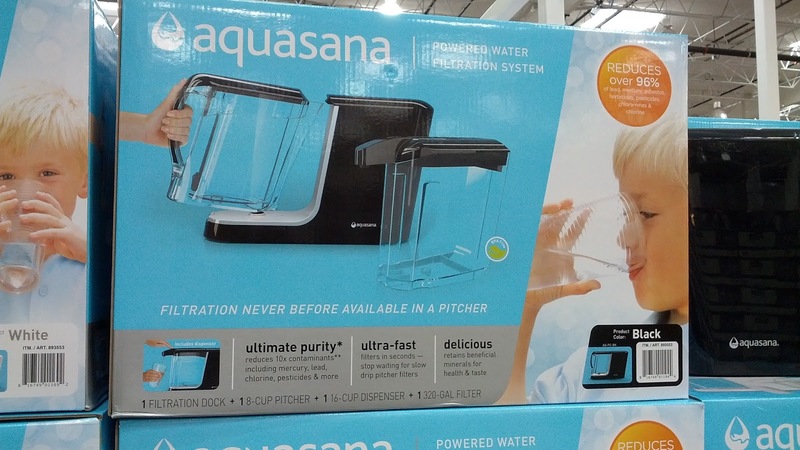 Aquasana Powered Water Filtration System removes unwanted items from your water. Aquasana Powered Water Filtration System deal at Costco. Filtration never before available in a pitcher. It's delicious and retains beneficial minerals for health and taste. Stop waiting for your old filter to drip through. The Aquasana Powered Water Filtration System filters in just seconds, so you get delicious, pure, water - fast. Ordinary water pitchers use gravity to slowly trickle water through loose charcoal particles, and they still only filter out a small number of possible contaminants. Aquasana's Claryum technology filters water in a way gravity-based pitchers can't - using pressure to quickly force unfiltered water through an ultra-dense, smart filter block. With one easy lift, you can filter up to 8 cups in seconds. What's better than Zerowater? or Brita? I went from their NON DENSE cheap filter to Aquasana AQ-PWFS-D-B 16-Cup Dispenser Powered Water Filtration System with extra 8 cup pitcher for the fridge. This unit is worth every penny! Had this for two months now and works perfectly. Even lights up (in two different locations) when you push the on demand button. Filters a gallon of water in seconds and tastes like filtered water should. Smooth, very clean and retains healthy minerals. The filter is certified to last 320 gallons or up to 6 months. When the blue light changes to a red blinking light, the filter has reached a 90% capacity, when it changes to a solid red light, the filter has reached 100% capacity and needs to be replaced. So far, 2 months and the water tastes just as good as the day I bought it. Works Perfectly! and I do believe I'm saving a lot more money on filters. 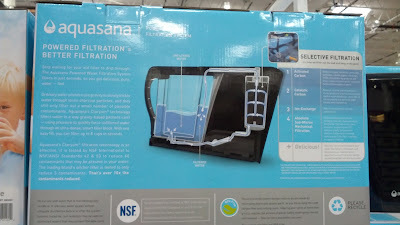 The best part is, I no longer have to wait long waiting times for the water to filter as in gravity fed filters, and looks pretty darn cool on my counter top. Easily fits right in between all my other clutter of gadgets (slender foot print). Highly recommended...and I'm not easily impressed by most gadgets. Sign up for "Water For Life": Lifetime System Warranty for as long as you're a member, inc 15% discount and free shipping (N. America Only) on filter replacements (auto ship every 6 months for 25.49). Comes out to 8 cents a gallon. Otherwise, the 6 month filters are 29.99 or 9.4 cents per gallon. Thanks @acecool for your thoughts on the Aquasana Powered Water Filtration System. I'm glad that you like it and that it's working out for you.